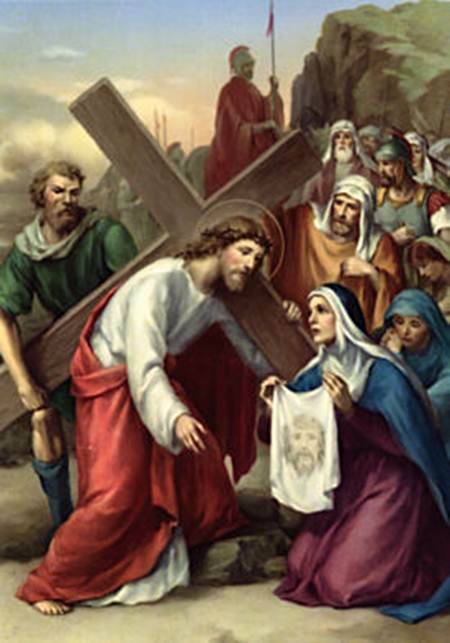 "Out of her special love for Christ’s Passion, which she had since childhood, St. Bridget sincerely wanted to know how many times the body of Our Lord was struck during the various scenes of his Passion. She repeatedly prayed about this so that she could honor each one of them. 4. Whoever prays these Prayers will attain the 1st degree of perfection. 5. 15 Days before his death, I will give him My Precious Body in order that he may escape eternal starvation; I will give him My Precious Blood to drink lest he thirst eternally. 6. 15 Days before his death, he will feel a deep contrition for all his sins and will have a perfect knowledge of them. 8. Before his death, I shall come with My Dearest Beloved Mother. 10. And having led it there, I shall give him a special draught from the fountain of My Deity, something I will not do for those who have not recited My Prayers. 11. Let it be known that whoever may have been living in a state of mortal sin for 30 years, but who will recite devoutly, or have the intention to recite these Prayers, Our Lord will forgive him all his sins. Re: The prayers taught by Our Lord Jesus to St. Bridget: Precious Blood,Holy Wounds. The 15 Prayers revealed by Our Lord to St. Bridget in the Church of St. Paul at Rome, approved by Pope Pius IX. These prayers can serve as the Way of the Cross, if we are unable to make the latter. O Jesus Christ! Eternal Sweetness to those who love Thee, joy surpassing all joy and all desire, Salvation and Hope of all sinners, Who hast proved that Thou hast no greater desire than to be among men, even assuming human nature at the fullness of time for the love of men, recall all the sufferings Thou has endured from the instant of Thy conception, and especially during Thy Passion, as it was decreed and ordained from all eternity in the Divine Plan. Remember the sadness and bitterness which Thou didst experience in Thy Soul as Thou Thyself bore witness saying, "My Soul is sorrowful, even unto death." O Jesus! True liberty of angels, Paradise of delights, remember the horror and sadness which Thou didst endure when Thy enemies, like furious lions, surrounded Thee, and by thousands of insults, spits, blows, lacerations and other unheard of cruelties, tormented Thee at will. In consideration of these torments and insulting words, I beseech Thee, O My Saviour, to deliver me from all my enemies, visible and invisible, and to bring me, under Thy protection, to the perfection of eternal salvation. Amen. O Jesus! 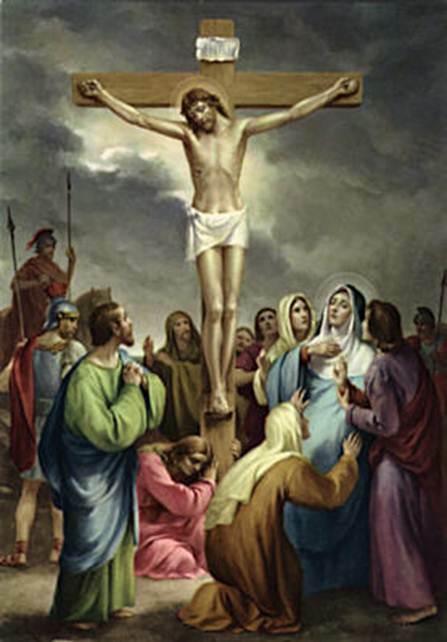 Heavenly Physician, raised aloft on the Cross to heal our wounds with Thine, remember the bruises which Thou didst suffer and the weakness of all Thy Members which were distended to such a degree that never was there pain like unto Thine. From the Crown of Thy Head to the Soles of Thy Feet there was not one spot on Thy Body that was not in torment, and yet, forgetting all Thy sufferings, Thou didst not cease to pray to Thy Heavenly Father for Thy enemies, saying: "Father, forgive them for they know not what they do." O Jesus! Mirror of Eternal Splendor, remember the sadness which Thou experienced, when contemplating in the light of Thy Divinity the predestination of those who would be saved by the merits of Thy Sacred Passion, Thou didst see at the same time, the great multitude of reprobates who would be damned for their sins, and Thou didst complain bitterly of those hopelessly lost and unfortunate sinners. Through this abyss of compassion and pity, and especially through the goodness which Thou displayed to the good thief when Thou saidst to him: "This day, thou shalt be with Me in Paradise," I beg of Thee, O Sweet Jesus, that at the hour of my death, Thou wilt show me mercy. Amen. I beg of Thee, O My Saviour, by the sword of sorrow which pierced the soul of Thy holy Mother, to have compassion on me in all my affliction and tribulations, both corporal and spiritual, and to assist me in all my trials, and especially at the hour of my death. Amen. O Jesus! Inexhaustible Fountain of compassion, Who by a profound gesture of Love, said from the Cross: "I thirst!" suffered from the thirst for the salvation of the human race. I beg of Thee, O My Saviour, to inflame in our hearts the desire to tend toward perfection in all our acts; and to extinguish in us the concupiscence of the flesh and the ardor of worldly desires. Amen. O Jesus! Who art the beginning and the end of all things, life, and virtue, remember that for our sakes Thou was plunged in an abyss of suffering from the soles of Thy Feet to the Crown of Thy Head. In consideration of the enormity of Thy Wounds, teach me to keep, through pure love, Thy commandments, whose way is wide and easy for those who love Thee. Amen. O Jesus! Strong Lion, Immortal and Invincible King, remember the pain which Thou didst endure when all Thy strength, both moral and physical, was entirely exhausted, Thou didst bow Thy Head, saying: "It is consummated!" Through this anguish and grief, I beg of Thee, Lord Jesus, to have mercy on me at the hour of my death when my mind will be greatly troubled and my soul will be in anguish. Amen. O Jesus! Only Son of the Father, Splendor and Figure of His Substance, remember the simple and humble recommendation Thou didst make of Thy Soul to Thy Eternal Father, saying: "Father, into Thy Hands I commend My Spirit!" And with Thy Body all torn, and Thy Heart broken, and the bowels of Thy Mercy opened to redeem us, Thou didst expire. By this Precious Death, I beg of Thee, O King of Saints, comfort me and help me to resist the devil, the flesh and the world, so that being dead to the world I may live for Thee alone. I beg of Thee at the hour of my death to receive me, a pilgrim and an exile returning to Thee. Amen. By saying these prayers many times, we can save 100s of souls of our relatives and friends; the Lord also taught St. Bridget 7 short Precious Blood Prayers to be offered to His eternal Father. For these, the Lord God gave the indulgence of 5 special promises, including being accounted a Martyr and suffering no Purgatory upon death. That is beside the possibility of saving many other souls by this simple means. Prayers Honoring the 7 Times Jesus Spilled His Precious Blood for Us, as Revealed by Our Lady to St. Bridget, and Approved by Pope Clement XII. Just as we glorify Jesus the most when we honor Mary the best, so we most compassionate the dolors of Mary and help to relieve the swords piercing Her Heart when we accompany Christ on the Way of the Cross and try in some small measure to console Jesus and Mary by our love. The Stations of St. Alphonsus Ligouri. ALL: My Lord, Jesus Christ, / You have made this journey to die for me with unspeakable love; / and I have so many times ungratefully abandoned You. / But now I love You with all my heart; / and, because I love You, I am sincerely sorry for ever having offended You. / Pardon me, my God, and permit me to accompany You on this journey. / You go to die for love of me; / I want, my beloved Redeemer, to die for love of You. / My Jesus, I will live and die always united to You. 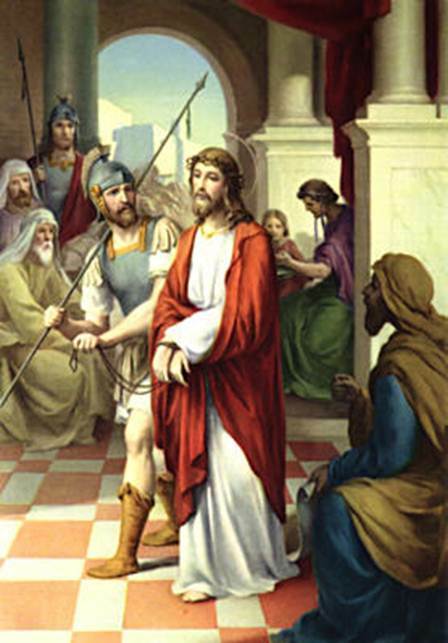 R: My adorable Jesus, / it was not Pilate; / no, it was my sins that condemned You to die. / I beseech You, by the merits of this sorrowful journey, / to assist my soul on its journey to eternity./ I love You, beloved Jesus; / I love You more than I love myself. / With all my heart I repent of ever having offended You. / Grant that I may love You always; and then do with me as You will. R: My most beloved Jesus, / I embrace all the sufferings You have destined for me until death. / I beg You, by all You suffered in carrying Your cross, / to help me carry mine with Your perfect peace and resignation. / I love You, Jesus, my love; / I repent of ever having offended You. / Never let me separate myself from You again. / Grant that I may love You always; and then do with me as You will. My good and dear Jesus, I kneel before You, asking You most earnestly to engrave upon my heart a deep and lively faith, hope, and charity, with true repentance for my sins, and a firm resolve to make amends. "They pierced My hands and My feet; they have numbered all My bones." At the age of 18, a young Spaniard entered the Novitiate of The Brothers of the Christian Schools at Bugedo. He took the Vow of Regularity, Perfection and Pure Love. 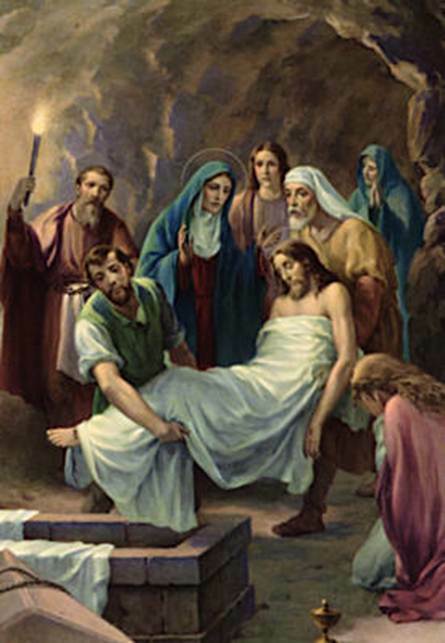 In October, 1926, he offered himself to Jesus through Mary. Soon after this heroic donation, he felt ill, and was obliged to rest. He died saintly in March 1927. He was, according to the master of novices, a privileged soul, who received Messages from Heaven. Confessors and Theologians recognized these supernatural facts. His Director asked him to write the Promises made by OUR LORD to those who have devotion to THE WAY OF THE CROSS. 1. 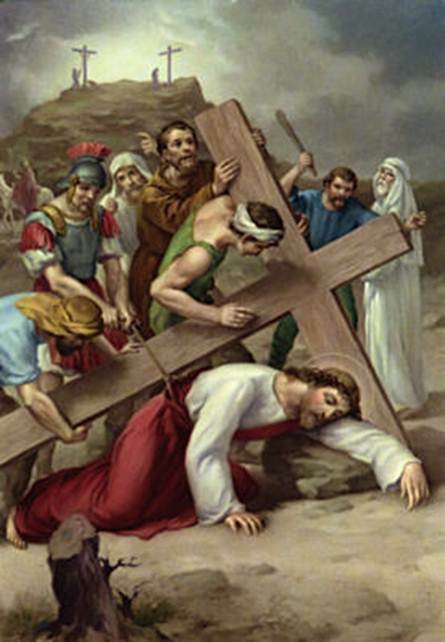 I will grant everything that is asked of Me with faith, when making The Way of the Cross. 3. I will follow them everywhere in life and I will help them, especially at the hour of death. 6. I will deliver them from Purgatory, indeed if they go there at all, the first Tuesday or Friday after their death. 7. 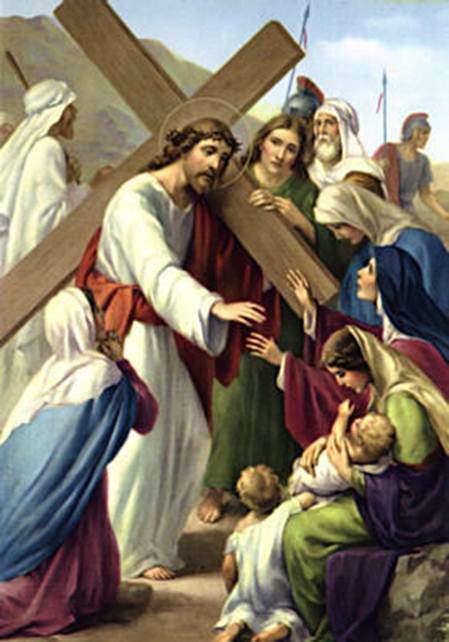 I will bless them at each Way of the Cross, and My blessing will follow them everywhere on earth and, after their death, in Heaven for all Eternity. 8. At the hour of death I will not permit the devil to tempt them; I will lift all power from him in order that they will repose tranquilly in My Arms. 9. If they pray it with true love, I will make of each one of them a living Ciborium in which it will please Me to pour My grace. 10. I will fix My Eyes on those who pray The Way of the Cross often; My hands will always be open to protect them. 12. They will never be able to separate themselves from Me, for I will give them the grace never again to commit a Mortal sin. 13. At the hour of death I will console them with My Presence and we will go together to Heaven. Death will be sweet to all those who have honored Me during their lives by praying The Way of the Cross. 14. My soul will be a protective shield for them, and will always help them, whenever they have recourse. St. Alphonsus Liguori wrote: "If you pray you are positive of saving your soul. 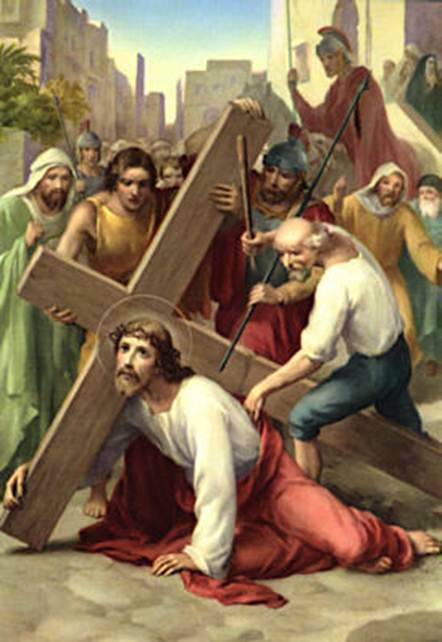 If you do NOT pray you are just as positive of losing your soul"
The Way of the Cross is among the most powerful spiritual devotions we can make outside of Holy Mass. Lent is especially suited to it. It has Apostolic roots. The 15 prayers taught by Our Lord to St. Bridget can serve for the Way of the Cross. 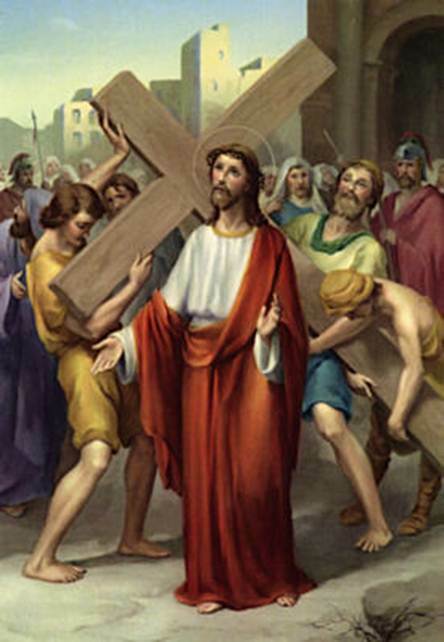 Let us contemplate the fasting and penances, the labors and sorrows undertaken by our Lord Jesus Christ to save the world and save our souls and let us resolve to follow Him as true disciples of the Cross, and co-operate with His works and sufferings, by bearing our daily crosses well, and by praying the Way of the Cross this Lent. 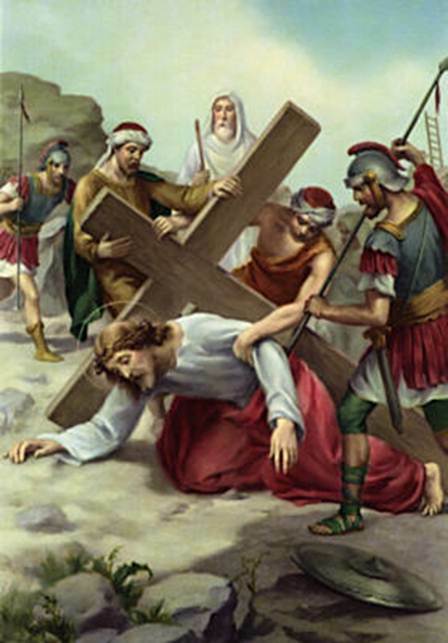 Since the Stations of the Cross composed by St. Alphonsus are above, I'll just post the pictures here for those who wish to pray and contemplate: https://www.ecatholic2000.com/liguori/stations/cross.shtml It is ideal but not necessary to pray them before Stations. A crucifix erected in one's house will do. Please note the Lord's promise to give the grace never to commit mortal sin again to those who regularly pray the Lord's Cross, "12. They will never be able to separate themselves from Me, for I will give them the grace never again to commit a Mortal sin". This is in accord with what St. Alphonsus teaches us to ask, and promises we will receive if we ask perseveringly in praying it, "R: My beloved Jesus, / it was not the weight of the cross / but the weight of my sins which made You suffer so much. / By the merits of this first fall, / save me from falling into mortal sin. / I love You, O my Jesus, with all my heart; / I am sorry that I have offended You. / May I never offend You again. / Grant that I may love You always; and then do with me as You will." It is necessary to fast not only from food, but above all from sins, and by persevering prayer we will unfailingly obtain efficacious grace to do that. 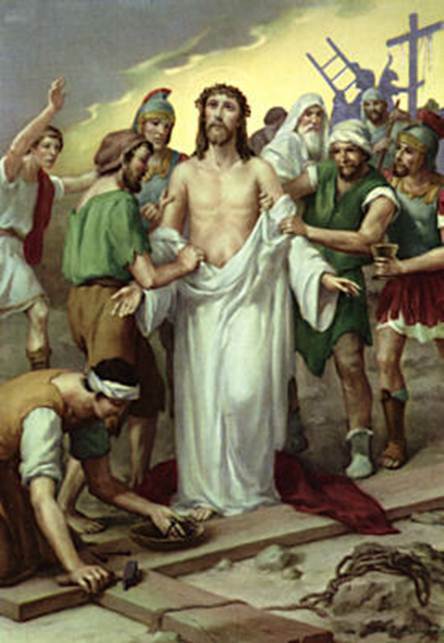 Station X: Jesus is stripped of His Garments. 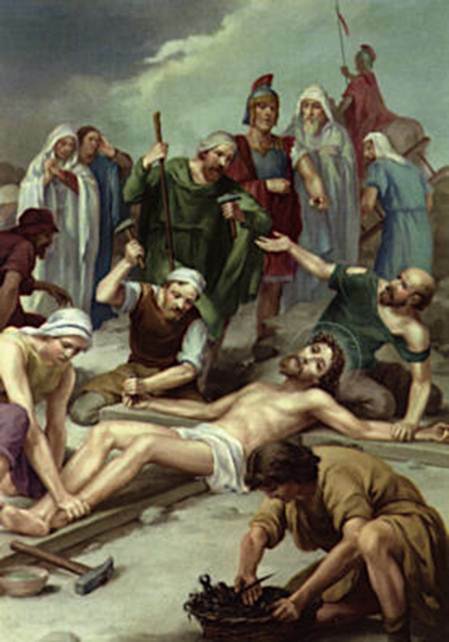 Station XI: Jesus is nailed to His Cross. 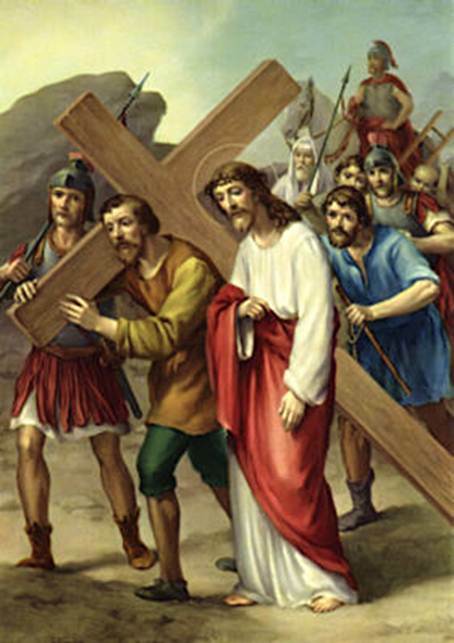 Station XII: Our Lord Jesus dies on the Cross. 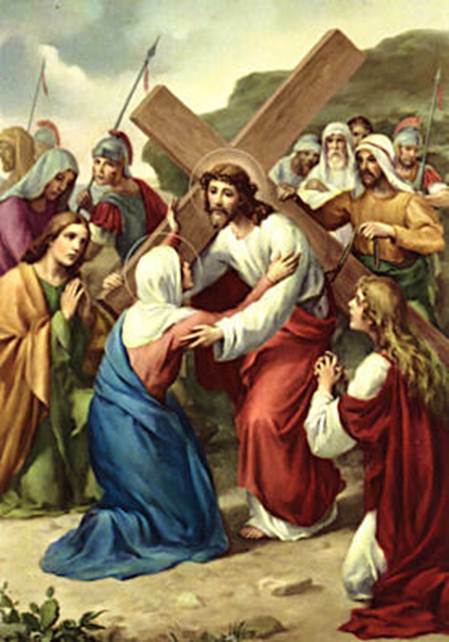 Station XIII: Jesus is taken down from the Cross in the arms of His Mother. 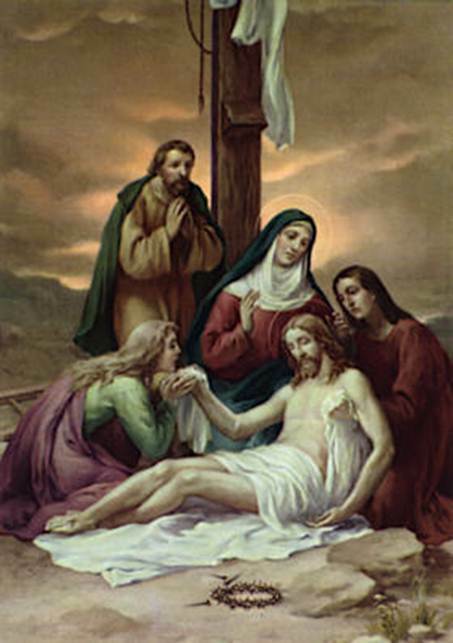 Station XIV: Jesus is buried in the Sepulchre until the Third Day. During Holy Week especially, let us try to pray the Way of the Cross, in remembrance of the terrible Price it cost Our Lord to redeem us. Let us try to say other prayers focused on the Precious Blood and Holy Wounds such as that Our Lord revealed to holy St. Bridget. Edit: Please note the Priceless and very important Promise the Lord made to the Way of the Cross. Grace never to commit mortal sin again.